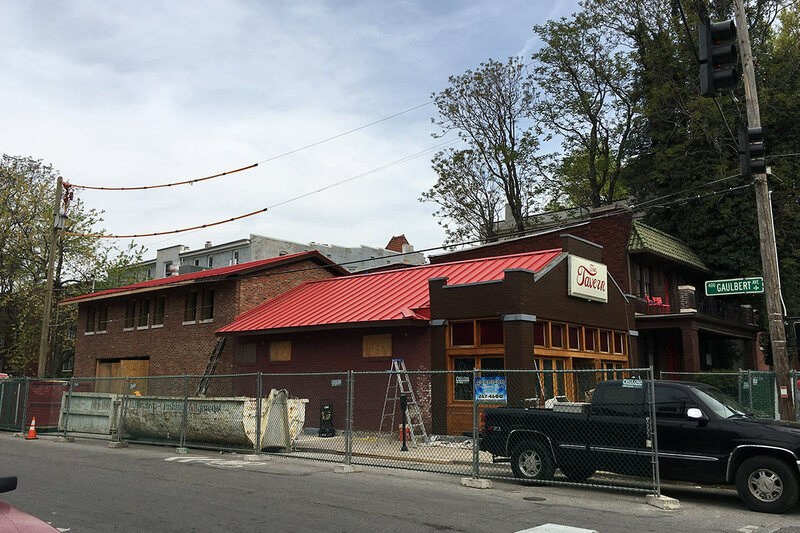 After ambitious renovation, the neighborhood watering hole is set to open on May 2. Around 3:30a.m. 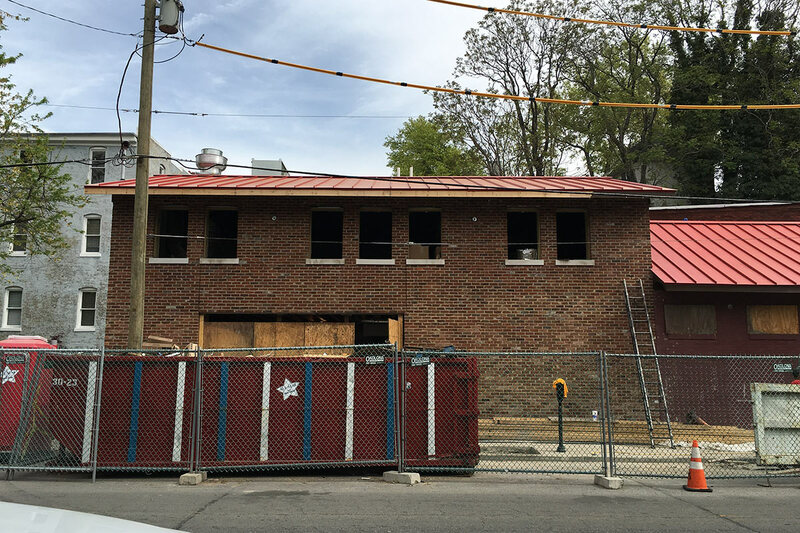 on a Tuesday morning in July 2014, The Tavern, an Old Louisville watering hole, caught fire. The blaze was the work of an arsonist who set a number of trash cans on fire in the neighborhood that night. Twenty two firefighters responded to the call, which destroyed the back portion of the building. 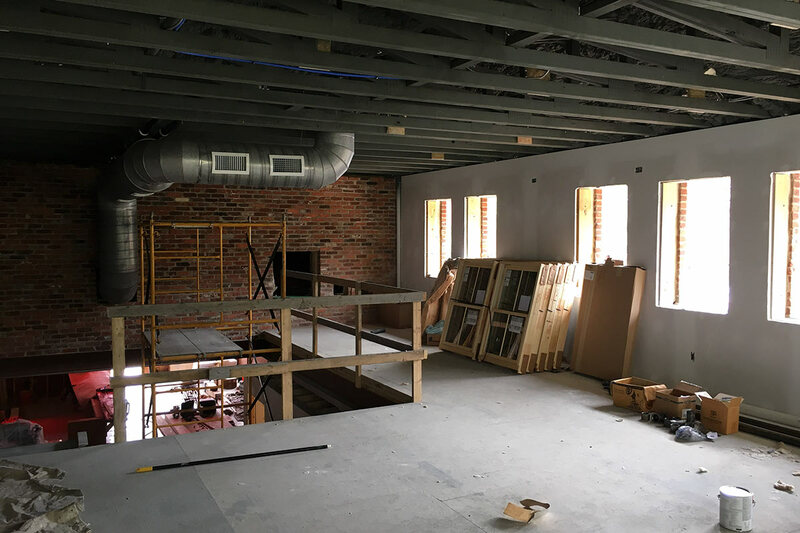 In 2012, attorney and entrepreneur Dan Borsch purchased the building through his family investment firm and he and business partner Scott Lukemire began to operate The Tavern business. “It was a bad fire,” Borsch told Broken Sidewalk. “We had been open just over a year when the arsonist hit.” At the time of the fire, Borsch had been renovation portions of the building. And while initial estimates of reopening in a few months turned into nearly two years, the wait has been well worth it. Borsch recently walked us through the busy construction site ahead of its May 2 opening and the new space is even better than the old. Walking in the front of the structure at Fourth Street and Gaulbert Avenue, new red stained glass transoms filtered the light shining through the front mahogany storefront facade. Borsch motioned to the left where several old doors and windows had been bricked in decades ago. He said those would receive the same red glass transoms as the front and serve as niches in the new space. Banquets are planned along the wall with a large bar on the opposite wall. 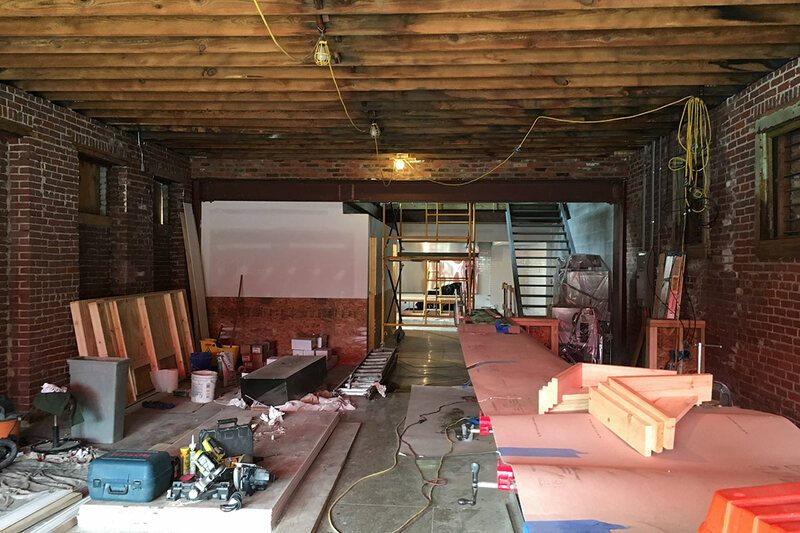 That bar will feature ancient timbers from another building Borsch owns, an old bourbon warehouse on First Street between Main and Market streets. That structure’s top two floors had to be demolished when a structural wall began to waver, but Borsch said he is closing in on a use for the remaining ground floor space next to the new Aloft Hotel. (Luckily Borsch gave us a tour of the building in 2008 before that demolition.) 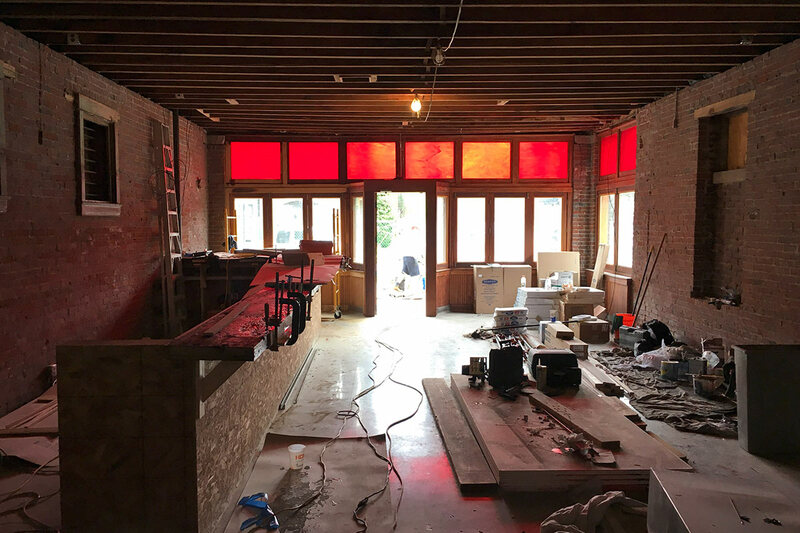 Joists with a 160-year-old patina now serve as The Tavern’s bar and a ledge along the front window. Original Terrazzo floors were mostly destroyed, but Borsch was able to save about the first six feet from the entrance. New polished, exposed-aggregate concrete floors mimic the original’s speckled patterns. Around the perimeter, new wainscotting is being installed, and overhead, Borsch is keeping the rafters exposed. Cash Moter of Louisville’s Joseph & Joseph Architects drew up the designs for the new space. The back portion of the structure had to be entirely rebuilt, and Borsch took the opportunity to add a second story for private events while maintaining the original style and feel of the old structure. Atop a set of steel stairs, the new space features hickory floors and an open, flexible arrangement. An old wooden storefront that existed in the original building was rebuilt into the new facade along Gaulbert where The Tavern’s kitchen is located, itself clad in an expanse of white subway tiles and stainless steel appliances. Borsch plans to add the same red stained glass to that storefront’s transoms as the rest of the building. Back in the ’20s, the rear storefront housed a restaurant called the Railroad Smoker, Borsch said. Up front was an A&P grocery store. He pointed to the strangely wide Gaulbert where all the buildings face away from the street toward pedestrian courts, noting that railroad tracks once came up through the area on their way east to connect to another rail line. Outside, the building mass now pops up in the back, giving the vague appearance of a sort of commercial camelback design. Borsch was careful to match the existing details and salvage as much of the old building as he could. “We reclaimed a lot of brick from the old walls and used them on the facade,” he said. Borsch pointed to a dividing line on the facade where The Tavern’s original wall, covered in paint, ended and the new wall began. He said the paint on the eastern half of the structure would be power washed off using a technique called “soda blasting.” It’s like sand blasting, but with baking soda instead of sand, Borsch explained, noting that soda is easier on the old building materials than sand. 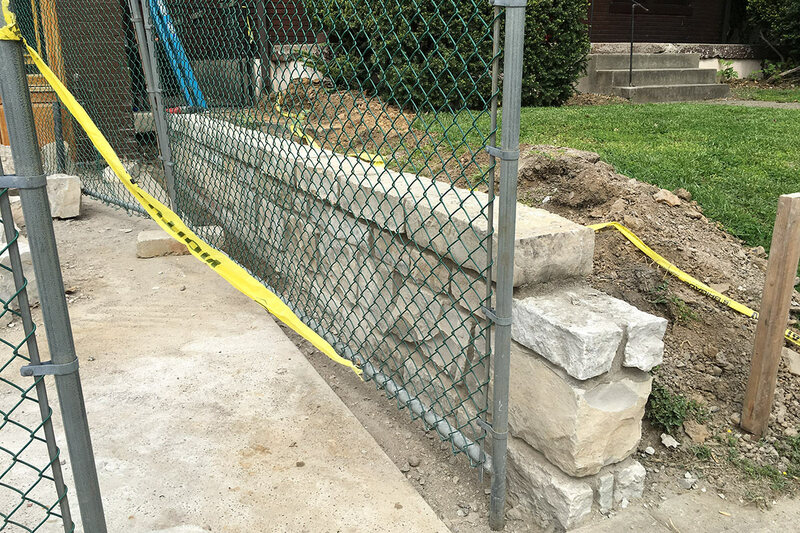 In another gesture toward reuse, Borsch brought hand-shaped limestone pieces of the foundation wall no longer needed when a new structural wall was added to the front patio. You can see them today forming a retaining wall. 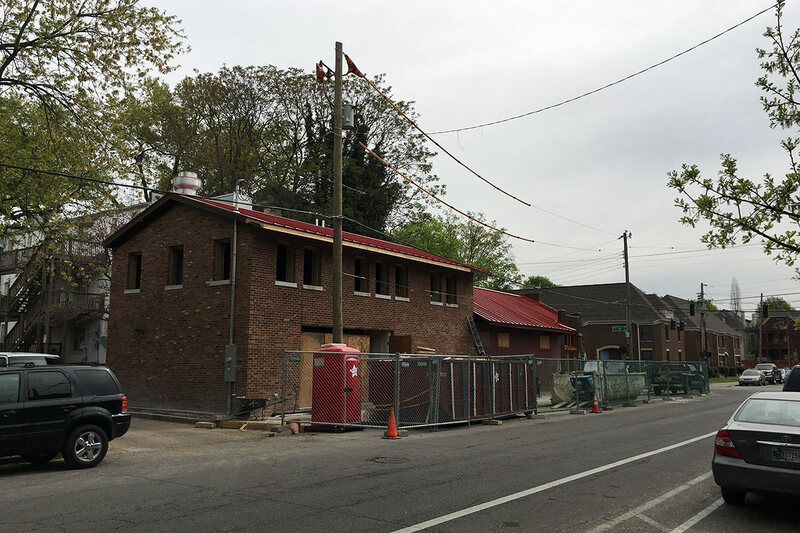 When it opens on May 2, the new Tavern will show off Borsch’s vision for the nearly century old corner commercial building. “It’s a nice mix of old and new,” he said. He and his architects have taken care to detail every piece of the building, from porcelain tiles in the bathrooms to the antique wood of the bars, to make sure the new space is better than the old. Yo, Karloff, I know Dan, and you’re misinterpreting his words. He’s not a condescending guy – He’s a good guy who cares about his neighborhood and his city. Very happy to see him back in business. I am glad to see “The Vern’ back. Kudos to the owners for their commitment and investment in the neighborhood. It took a lot of guts to rebuild after such a devastating fire. Good job guys. So when is it actually opening? that’s what I want to know! Walked by the other night and was dark as could be. My house was burnt down the same night right before he burned down The Tavern. HUGE CONGRATULATIONS on your reopening!! All the best of luck to you!!!!! !